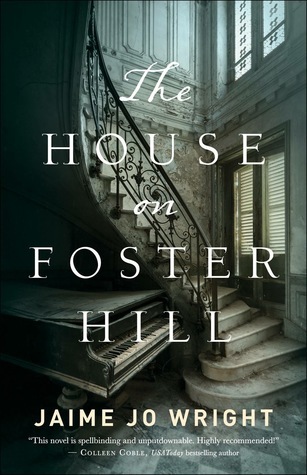 The House on Foster Hill is by debut author Jamie Jo and what a read! Between plot twists, mystery, suspense and incredible details, this book will captivate you, while holding your attention between two time periods. Written in a dual plot lines with immense attention to detail, this book will keep you intrigued. Kaine Prescott is grieving the loss of her husband who passed away two years ago. After begging in desperation to re-open the case after the suspicious death of of her husband, Kaine decides she needs to leave home and get a fresh start. Kaine decides to purchase "The Foster Hill House." Little did Kaine know what would be in store for her and the purchase of this abandoned property. Painful memories are what Ivy Thrope has of Foster Hill a century earlier. When a woman is found dead on the property, she can't help but try to discover the identity of the woman. Of course, Ivy is lead on a course that is dangerous, risk-taking and possibly losing her life as she works to uncover the mystery. Full of suspense, page turning and history, this book will draw you immediately as the characters have your attention. If you are a fan of suspense and mystery, this book is definitely one that you have to read! Just when you think you know who did it, it isn't who you think it is, or is it? You'll have a great time trying to piece this mystery together! I give this book 5/5 stars. Professional coffee drinker & ECPA/Publisher's Weekly best-selling author, Jaime Jo Wright resides in the hills of Wisconsin writing spirited turn-of-the-century romance stained with suspense. Coffee fuels her snarky personality. She lives in Neverland with her Cap’n Hook who stole her heart and will not give it back, their little fairy TinkerBell, and a very mischievous Peter Pan. The foursome embark on scores of adventure that only make her fall more wildly in love with romance and intrigue.